Paula Bennett, Year 6 teacher at Beckfoot Heaton Primary School in Bradford, recently attended the Our Stories creative writing and performance poetry training at the Bradford Cartwright Hall Art Gallery and Museum. Our Stories is a poetry programme, which is delivered as part of the National Literacy Trust Hub in Bradford (branded Bradford Stories) and the Voice Bradford initiative. 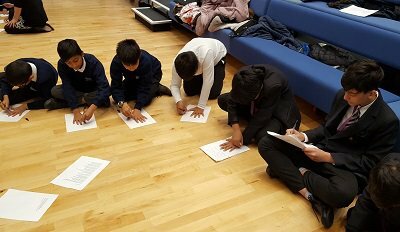 In October 2017, Paula brought 90 Year 6 pupils to Beckfoot Upper Heaton to take part in different workshops designed to help them get used to the idea of moving up to secondary school. Year 7 students at Beckfoot Upper Heaton also took part in the day, helping to support the primary school pupils. Find out more about the Bradford Stories campaign.